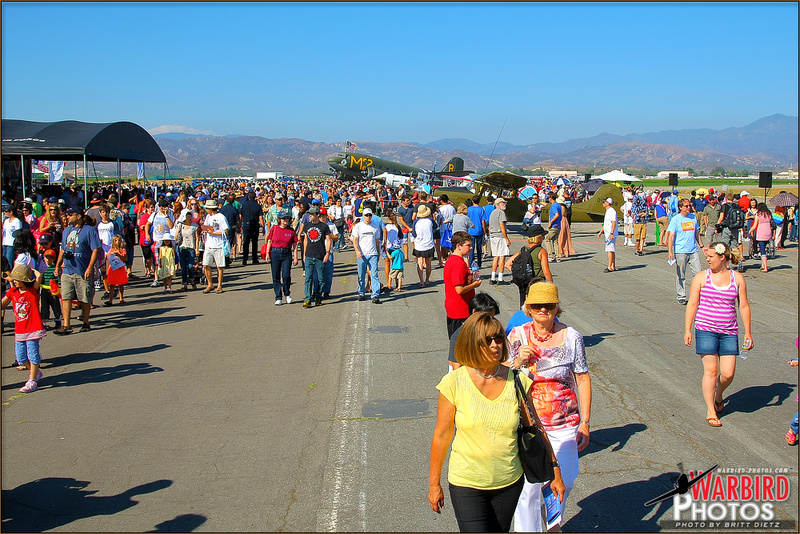 Irvine, California - Cutting through the stillness that normally descends on the former MCAS El Toro base, once again the now named Great Park of Irvine celebrated its anniversary celebration for the 2012 year with a day of airshow flying, vendors, music, and fireworks. 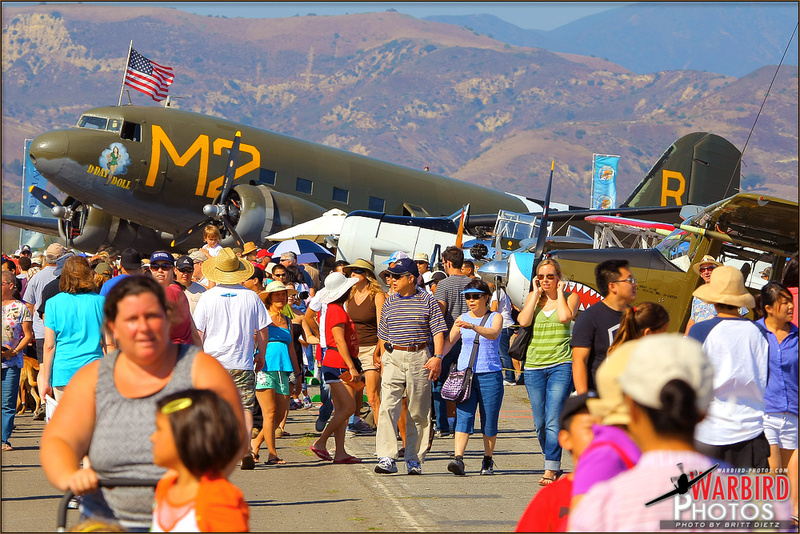 Visitors walk by the Commemorative Air Force aircraft at the MCAS El Toro Great Park of Irvine Airshow 2012. -Photo by Britt Dietz This year's Growing the Park airshow event brought out even more static display aircraft and a really impressive lineup of modern US Marine aircraft in celebration of the Marine Corps Aviation centennial anniversary. Even as the weeds grow taller and the buildings around the former base continue to disappear in piles of rubble, the spirit of the MCAS El Toro Airshow lives on through this one day airshow and celebration event bringing out thousands of people who fondly recall the days when the Blue Angels would take to the skies and the roar of fighter jets filled the air on a daily basis. The airshow celebration has steadily grown since it was first started 7 years ago with more aircraft participating and more people attending. It's a word of mouth type of show, and the word is steadily getting out there. MCAS El Toro used to be the home of one of the largest arms of the US Marine Corps Aviation, the 3rd Marine Air Wing. When the base was unfortunately selected for closure in 1993 and officially closed in 1999 relocated all the aircraft and assets down to MCAS Miramar in San Diego and the base was to be converted into an airport. (you can read more about the history of the MCAS El Toro base on last year's MCAS El Toro/Great Park Airshow review located here) The residents of Irvine rallied together and were able to change the future of the former base shooting down the idea of a civilian airport and instead voting in favor of a large park to be built on top of the base with a variety of fields, faculties, and tributes to the history of Orange County. 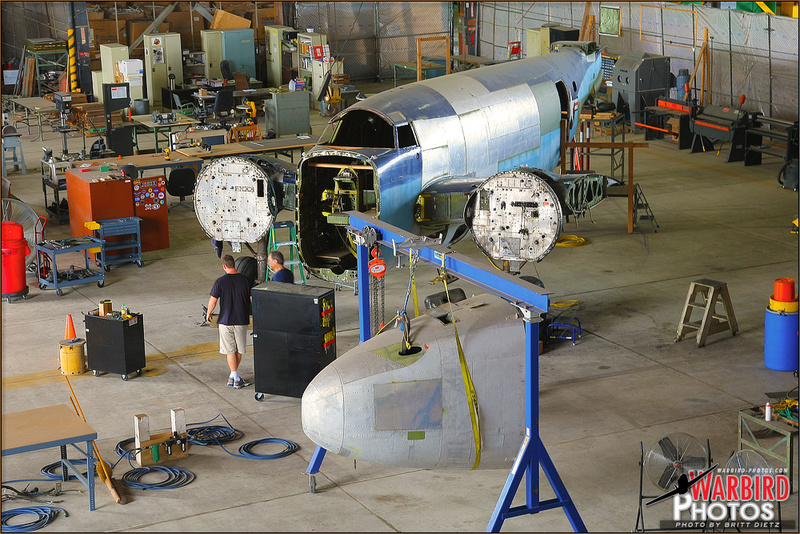 A rare Lockheed PV-1 Ventura is being restored in one of the former MCAS EL Toro Hangars. -Photo by Britt Dietz Unfortunately due to very tough times, the progress on this park has been progressing quite slowly, and the final product modified several times. Currently, the highlight of the great park (aside from the abundant green fields, kids play area, and carousel) is the large 'orange ball' balloon that takes people up high into the air on a giant tethered helium filled balloon. It offers panoramic views of the former MCAS El Toro base and the entire Orange County region. Aside from the orange balloon, another main attraction in the works is an aviation/military museum that will be filled with many different aircraft, vehicles, and other artifacts that celebrate the former base. Currently housed in one of the old VMGR-352 "Raiders" C-130 Hercules maintenance hangars is where this up and coming museum is being collected which includes a Consolidated N3N-3 Canary, North American SNJ-5 Texan, and a currently being restored Lockheed PV-1 Ventura. Artifacts that were saved from around the base have been stored in this hangar as well for eventual display to the public keeping alive the spirit of MCAS El Toro. 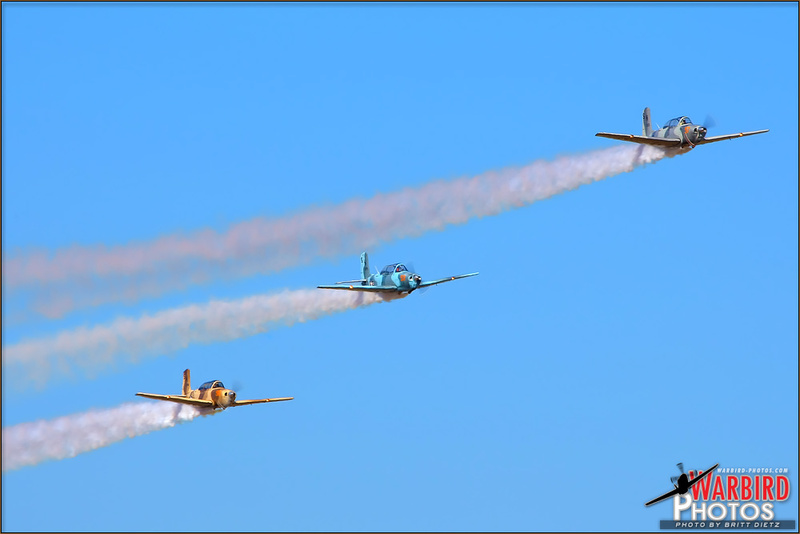 This year's MCAS El Toro/Great Park Airshow celebration coincided with the US Marine Corps centennial, which being a former US Marine Corps Air Station base, the US Marines wanted to come out in force showcasing some of their best and latest. A Bell MV-22 Osprey from VMM-163 'Evil Eyes' comes in for a landing on one of the old MCAS El Toro runways. -Photo by Britt Dietz Last year, the Marines sent out an impressive display of two CH-46 Sea Knights (including one that was stationed at MCAS El Toro) along with brand new AH-1Z Viper and UH-1Y Venom helicopters. This year, the Marines stepped up the displays sending out not only a Bell AH-1W Super Cobra from MLAT-303 'Atlas' (based at Camp Pendleton), but also my personal favorite a heavy lifting Sikorsky CH-53E Super Stallion from HMH-466 'Wolfpack' (MCAS Miramar) and the most popular display of the show a tilt-rotor Bell MV-22 Osprey from VMM-163 'Evil Eyes' (from MCAS Miramar as well). 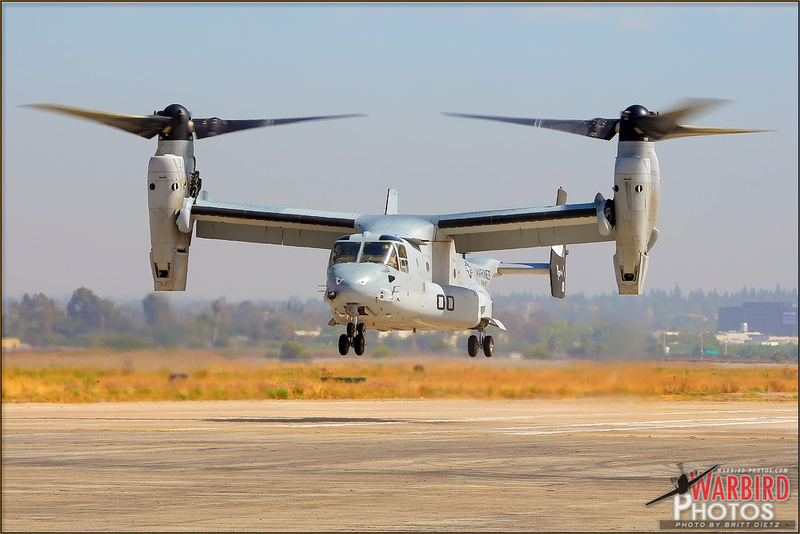 An added bonus is that not only is this first time an Osprey has landed at MCAS El Toro, but that at one time the Osprey's squadron HMM-163 'Evil Eyes' was stationed at El Toro when they were flying Boeing CH-46 Sea Knights when MCAS Tustin closed. In fact, the 'Evil Eyes' hangar still stands with the squadron's logo painted on the outer doors. These three aircraft were easily the most impressive arrivals at the airshow event this year and large amounts of people waited patiently in long lines to walk through the aircraft and tour the cockpits. Most of the static aircraft arrived on the Friday or just before the one day only (Saturday) airshow. Aircraft could call in on a common frequency to the area and alert the ground air boss and any transitioning aircraft in the area that they were setting up to land. Using the 8,000 foot 34L runway, the aircraft would come in one at a time and taxi into the show area. Warbird aircraft are lined up at the 2012 MCAS El Toro Orange County Great Park Airshow. -Photo by Britt Dietz Warbirds were far the most numerous of the static aircraft, especially from the Commemorative Air Force bringing out some very nice Warbirds from their Riverside collection. This included the Douglas C-53D Skytrooper known as "D-Day Doll," a North American T-6G Texan/Harvard II, Ryan PT-22 Recruit (ST3KR), and a Piper L-4F Grasshopper. Other static aircraft included two Great Lakes 2T-1A-2, Clark John M Jr THORP T-18-C (yes, that's really an airplane name), Texas Sport Cub TX11J, 1946 Piper PA-12 Super Cruiser, several Boeing PT-17 Stearmans, a beautiful red 1940 Waco ZPF-7 biplane, 1950 Cessna 140A, Cessna O-1E Birddog from Lyon Air Museum, another dark blue North American SNJ-5 Texan, Cessna 190 in LC-126 military colors, and a bright red Yakovlev Yak-52. FedEx brought out one of their Cessna 208B Caravans alongside a few different FedEx trucks. Finally, the US Coast Guard brought out one of their bright orange Eurocopter MH-65C Dolphins and the Orange County Fire Authority brought out their loud Bell 412 which is an upgraded Huey model. Vehicles spanning World War 2 to modern day were displayed as well, including some vehicles and a M777 Howitzer 155mm artillery cannon from Camp Pendleton. Vendors at the event included t-shirts, toys, different organizations and fire departments, and the usual Flight Museum based at MCAS Miramar. Food vendors were plenty, with over 20 different food trucks arranged in a wagon type of circle making a food court with a lot of different choices and different prices ranging from good deals to about standard. 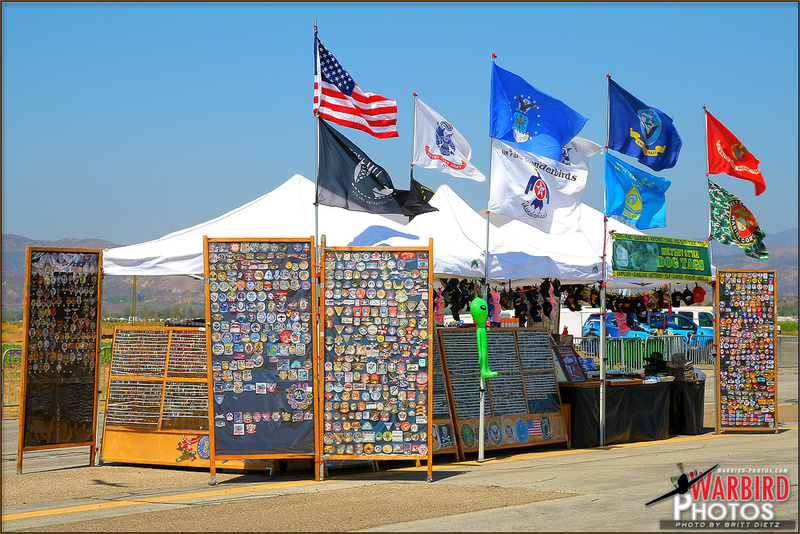 A vendor selling patches and pins at the 2012 Orange County Great Park MCAS El Toro Airshow. -Photo by Britt Dietz Finally, a large stage was set up next to the orange balloon where a live band played throughout the day, mainly cover songs of the band U2. This was the first year of paying to park, which was $10 for every vehicle entering the park. Some visitors mentioned that the parking was pretty easy being parked on one of the old taxiways stretching down to the end of the base with shuttles helping take people right up to the entrance into the static aircraft area. Besides from the $10 to park, admission into the event was free. Leaving the base later in the evening after the fireworks display was a bit trickier, and long lines of cars trying to exit out of only two exits from the base made the pace a bit slow. This has been a problem from the event organizers, when several thousand people descend onto the event and stay till after the firework show. Unlike most airshows that start earlier in the morning, this airshow event is unique in the fact that the gates don't even open until 3:30pm. Gates did end up opening a bit earlier for those who decided to get there earlier and wait in line much to their delight. 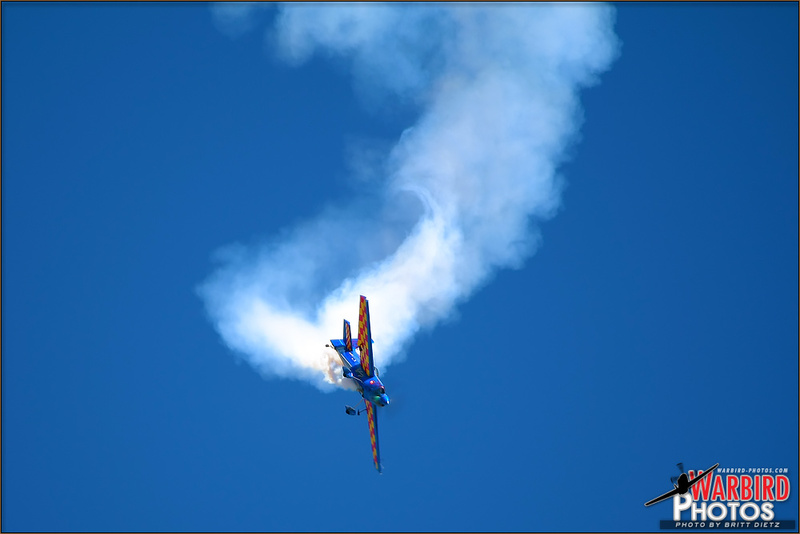 Melissa Pemberton and Jon Melby fly together during their joint aerobatic performance at the MCAS El Toro Airshow 2012. -Photo by Britt Dietz The airshow portion of the event began just past 4pm with the opening ceremonies followed by a jump by the 'Just in Time' Skydivers from their Beechcraft D18S. Following the return of the jump plane, Jon Melby and Melissa Pemberton were launched in their aerobatic planes for a fun demonstration of different aerobatics by each performer while they talked to the crowd themselves from the cockpits describing their maneuvers. Jon Melby flew his Pitts S-1-11B and Melissa Pemberton in her Edge 540. Unfortunately, next up was supposed to be a flyby of a US Air Force Reserve Boeing C-17A Globemaster III from March ARB, but technical issues came up and the C-17 had to cancel making a bit of a whole in the schedule, but soon three Beechcraft T-34A Mentor trainers from March ARB known as "Eagle Flight" took to the skies performing various formation passes and maneuvers as the announcer described each pass and the difficulties of formation flying. 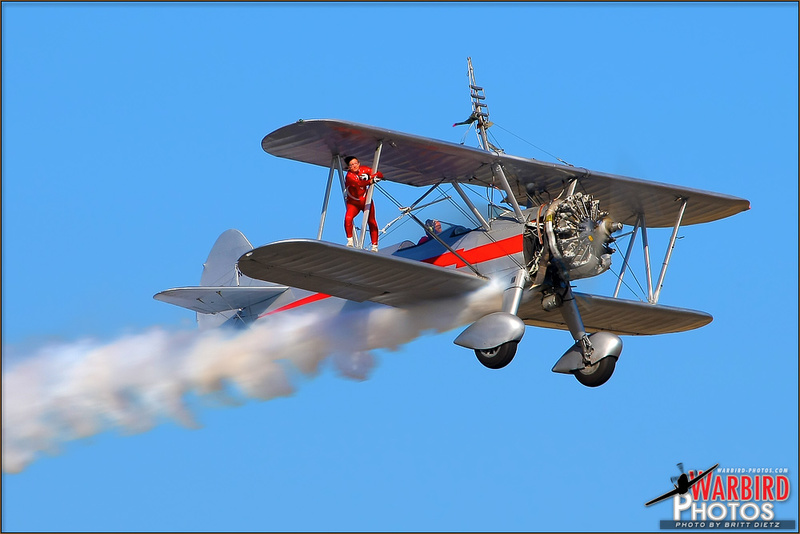 Margaret Stivers stands on top of a Stearman biplane during the Silver Wings Wingwalkers at the Great Park Airshow 2012. -Photo by Britt Dietz Following the Eagle Flight, Margaret Stivers took to the air with her husband for the always fun to watch Silver Wings Wingwalkers demonstration. 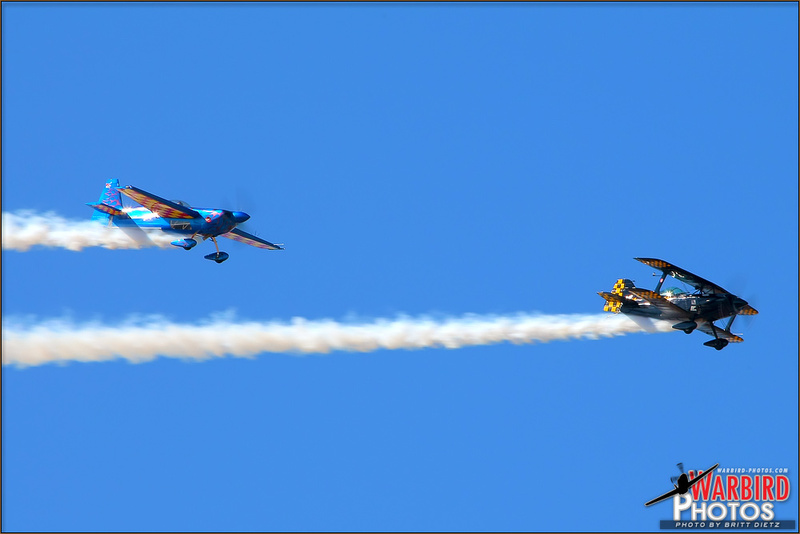 Margaret performed a 'ballet in the sky' as she positioned herself on different parts of the PT-17 Stearman biplane harkening back to the days of barnstorming. After the Wingwalkers it was time for Melissa Pemberton to take to the skies again in her beautifully blue Edge 540 for her complete aerobatic demonstration. Next up was John Collver in his North American SNJ-5 Texan named 'War Dog' which actually served at MCAS El Toro back in World War 2. John put on his usual great display of Warbird aerobatics giving the crowd a look at the training and capabilities of this World War 2 plane. With only two more acts to go, John Melby took to the skies again in his Pitts S-1-11B for his full demonstration making wild spins in mid-air. The final act of the day to conclude the airshow portion of the event was another jump by the 'Just In Time' skydivers, which really was just in time as the fast approaching marine layer began to blanket the skies over Orange County. Once the last skydiver had landed, it became a mad rush to launch as many of the static aircraft out of there to head home before it became impossible for the aircraft to safely leave with the thickening marine layer. 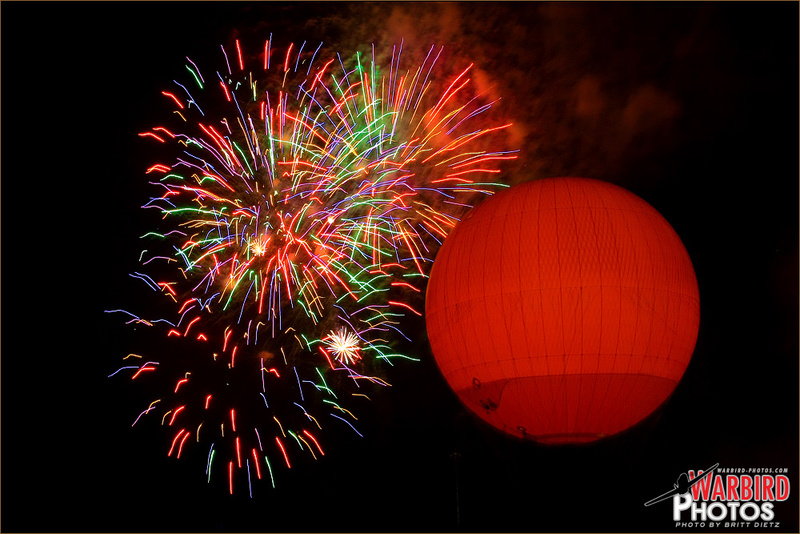 Fireworks light the Irvine night skies next to the giant orange balloon at the Great Park Anniversary Celebration 2012. -Photo by Britt Dietz Clearing out the static display area of the crowds helped to get the aircraft pushed out to the taxiway, and many almost immediately took off from the cross runway 7L. As the last few aircraft made it into the air as the last bit of light began to fade, the airshow had concluded. The aerial area remained closed off to the visitors and many took the time to get food and look at the vendors before getting a seat for the evening firework show. At about 9:10pm, the firework show began set to some different music (much like Disneyland's fireworks style) and lasted a good 20 minutes. With the end of the fireworks, the event was officially over and people began to pack up their things and make their way to the line of cars slowly exiting the base. This year's show might have had a few less performances than last year, but the incredible static display line-up of Warbirds, civilian, and modern Marine aircraft really stood out putting to shame many civilian airport airshows just in the sheer number and types. I have no doubt this airshow event will continue to grow as more people hear about it and head on out to not only see what the Great Park buzz is all about, but to remember the fond days of being out at MCAS El Toro watching the US Navy Blue Angels fly. Here's to the 2013 airshow and hopes that it'll be bigger than ever! PARKING: $10 this year and pretty easy to park if you get there early. Otherwise lines can get long with only two entrances to the base. Once inside, though, its quick parking in the massive parking areas on the former tarmacs of the base. Shuttle service provided to the airshow area, or you can walk. SEATING: The only seating was park benches and assorted tables located in the Great Park area near the large orange balloon and food courts. You could set up chairs near the fence line or stand. WEATHER: Humid and hot. Drink water and bring sunscreen. SECURITY: No security lines to go through, but police patrolling. 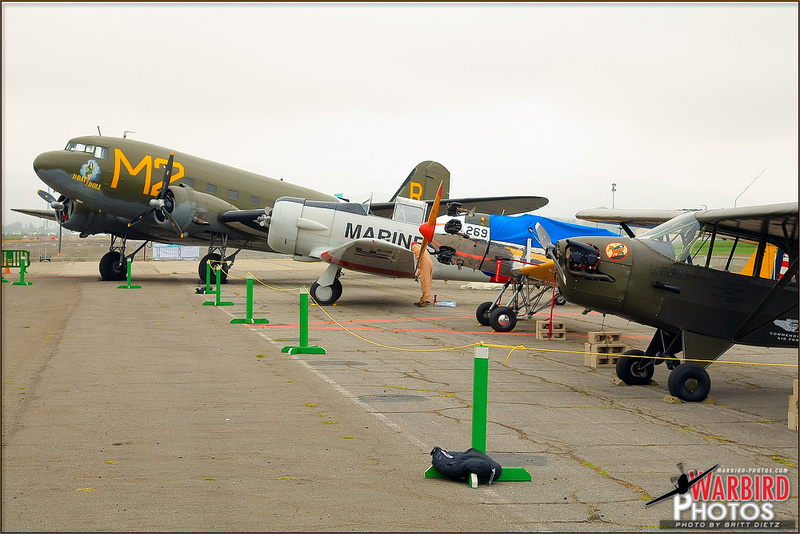 DISPLAYS: Small assortment of warbirds from the military museum along with some fly-in warbirds from different airports. US Marines sent out several aircraft including an Osprey. DISPLAYS: Several aerobatic demos, wingwalker show, and warbird flybys throughout the day and sky divers to open the show. FOOD: HUGE assortment of various food trucks (20+) this year. VENDORS: A couple of local groups and activities for kids along with the usual toys and apparel. EXIT TIMES: Slow due to the limited exits from the base. Wait till after the exit lines have died down and enjoy the booths or leave before the fireworks to avoid the lines. OVERALL: Continuing to grow and get support by the US Marines, this show continues the spirit of the former MCAS El Toro Airshows every year bringing new people to the base and many who visit the shows back in the day to relive their childhood or fond memories of serving on the base. This airshow is a must attend, if nothing else, to see the variety of aircraft on display and to see what the military brings out! 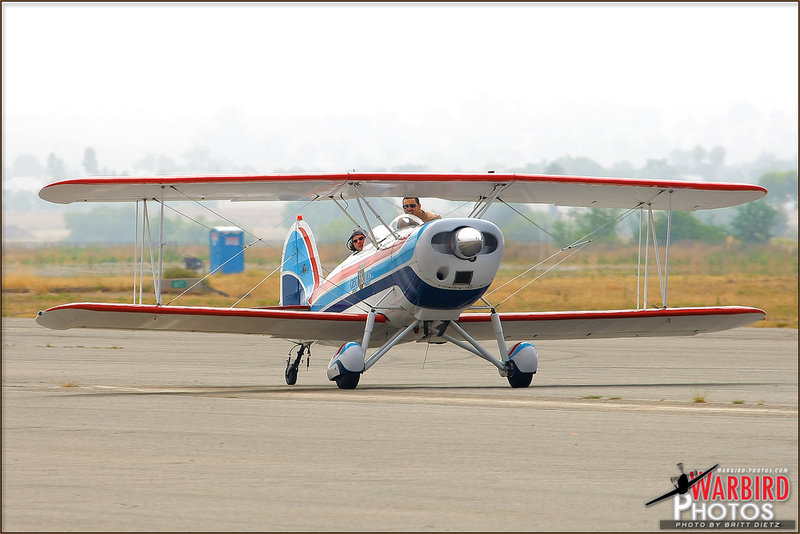 MCAS El Toro Great Park Airshow 2012 Aircraft arrivals photo gallery on Warbird Photos. HIGHLIGHTS: The former MCAS El Toro base, now called the Great Park of Irvine's anniversary celebration featuring an airshow that continues to grow each year.